Healthier and Better Tasting than Table Salt! 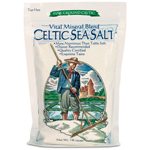 Why use Celtic Sea Salts? 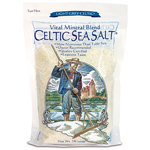 Celtic Sea Salts are a prime condiment that stimulates salivation, helps to balance and replenishes all of the body's electrolytes. It supplies vital trace minerals to promote optimum biological function and cellular maintenance. Properly stored, salt keeps virtually indefinitely. This ain't your daddy's table salt. Well, maybe it is, if your daddy is a salt farmer in France. We distribute genuine natural Celtic Sea Salts produced without refining, oven drying or chemical additives for the best possible health. The salt normally used in most homes and restaurants (refined table salt) is very different from unrefined Sea Salt. Table salts are mined from the earth with bulldozers and heavy machinery, and then iodized, bleached, and diluted with anti-caking agents. Chemicals are added to refined salt in the processing and all the beneficial minerals and trace elements that are found in natural Celtic Sea Salt® are removed. So you lose out both ways! Natural salts that come from pristine clean salt farms very definitely make food more tasty, and these salts make food more digestible, and may often, even measurably, help improve health. 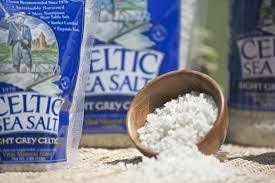 Natural Celtic Sea Salts are a “moist” unrefined sea salt usually found on the coastal areas of France. Its light grey, almost light purple color comes from the clay found in the salt flats. The salt is collected by hand using traditional Celtic methods. Light Grey Celtic Salt has gained great fame in the culinary world and is considered by many to be the tastiest, best quality salt available. Properly stored, sea salts keep virtually indefinitely. A reserve stock of natural Celtic Sea Salts to good to keep on hand. This natural products is obtained from traditional organic salt farmers, under the highest quality controls. The method used for gathering them follows a time-honored 2,000 year-old Celtic culture and tradition, supported and authenticated by modern Quality and Purity control establishments. Trace elements are found in minute quantities in sea water and in natural unrefined sea salt, but are often absent in food and dietary supplements. Trace elements are needed to assure and maintain proper function of the body's systems. If any one of them is left out -or even just diminished - a link will be missing, and the whole organism will suffer. That is, if any of our internal oceans are shortchanged of trace nutrients, the body will lack the triggering bio-electrical impulses and mineral building blocks necessary to operate at full efficiency or to renew its cells properly. 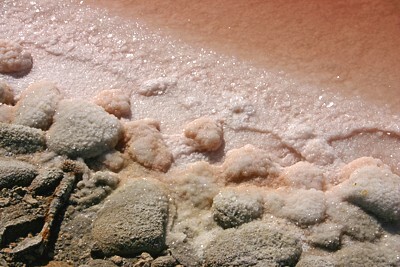 Humans need the whole, clean salt from rich ocean brine with all its trace minerals. Genuinely healthful sea salt is composed of minerals from the ocean waters which have been transformed by microorganisms, algae and plants into organic nutrients; these in turn are bioavailable to animals of the sea and land. The ocean contains the precious minerals our body requires for optimum function. The salt refiners, however keep these facts hidden from the public because they profit from selling the additional minerals they extract from the rich sea salt using chemical processes. The same vital minerals, when left in the natural salt make unrefined sea salt a vital necessity and its color light gray. Public health policy should be guided only by proven facts. Current scientific research reveals that there are actually very few salt-related health problems. Sodium, in the form of sodium chloride, plays an important part in the primary processes of digestion and absorption. Salt activates the first enzyme in the mouth, salivary amylase. At this stage, sodium exposes food to the tastebuds -a reason why food has always been salted "to taste"- it also helps start digestion by breaking down food. In the parietal cells of the stomach wall, sodium chloride generates hydrochloric acid, one of the most important of ail digestive secretions. If potassium is in excess in relation to sodium, the body's enzyme pathway loses its ability to produce hydrochloric acid. Thus most diets, but especially vegetarian and grain diets, require slightly more salt in order to prevent an excess of potassium over sodium. With salt present, the acidity of the partially digested food is able to trigger off some needed natural sodium bicarbonate, derived from the supply of sodium chloride, as well as enzymatic and bile secretions from the gall bladder and pancreatic ducts. Without salt no digestion is possible. The research of Dr. John H. Laragh, M.D., at the Hypertension Center of the New York-Cornell Medical Center, shows that the High Blood Pressure (HBP) problem lies not in salt intake but in an overactive hormone system. When this system is overactive, there are high renin levels (renin is a protein-digesting enzyme that acts in raising blood pressure. ), body salt content is usually excessively reduced and thus salt starvation could occur if the patient is put on a low salt diet. On the other hand with low renin levels, which occur only in a third of hypertensive people, a sodium excess occurs. Only people in the last group should lower their sodium intake. Consult your docotor to determine how this might apply to you. The percentage of valuable magnesium salts varies greatly from one natural salt to the others. Even within the same salt farm, it is possible to extract two salts of slightly different magnesium content. Cold, active, northern seas, because of upwelling and other marine and climatic conditions, offer the advantages of a richer mix of minerals. The geography and orientation of the coastline also play an important part in the final quality of the naturally-extracted sea salts. Winds not only dry more than sun alone, but "load" the salt flats and stacks with additional trace elements, mainly iodine salts, carried as spray from the crests of waves. Finally, the method used for gathering salt from natural flats and separating it from the hard clay sole is crucial to the production of health-giving salt. There must be some constant eddying movement to the brine (salt water) - over and through the clay flats, creating crystalization. In order to ionize and harmonize the trace elements by the clay's filtering action, the final hand-raking of the moist crystals is done by artisans with such a skillful light touch that almost no particles of clay appear in the finished natural product. In the case of "Flower of Ocean" salt, an almost white Celtic salt which is also harvested traditionally and rare because it crystallizes naturally on top of the water only during the hottest days of the harvest. The gathering is done delicately from the top layer of the brine and thus NO clay is ever trapped in the final smaller crystal structure. 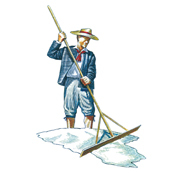 Both methods just described are still followed by a dedicated group of professional natural salt farmers in Europe who perpetuate the traditional skills passed down through generations from antiquity. 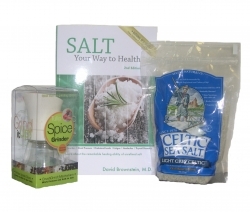 When harvested in these ways, both of these natural Celtic Sea Salts are highly beneficial to anyone's health as they possess therapeutic qualities that are capable of restoring balance, even despite longstanding imbalances. If concrete-lined beds are used instead of this natural traditional method, as in refinery-type salt, the efflorescence of the cement pollutes and loads the salt with toxins, so bad for health. Domestic salt refiners cannot economically develop a production method that will yield clean whole food salt. The market for edible salt is too small to bother with when compared with the huge industrial consumption. The trace elements such as magnesium, bromide and sulfur, are all extracted from sea salts by those refiners since they are a great source of profit for the multinational big ocean chemical business. Long ago the U.S. government directly asked the refineries to define what constitutes edible table salt. It was profitable and convenient for these salt and chemical conglomerates to tailor the requested definition to fit their own product: Salt, they declared, "must not contain over 2 1/2% of trace minerals -- back then, all minerals were lumped together under the term "impurities" and were extracted for their profit. Refinery salt, however, may legally receive up to 2% of chemical additives, such as bleaches, anti-caking agents and conditioners. None of these need to be shown on the label! Ferrocyanide, yellow prussiate of soda, tricalcium phosphate, alumine-calcium silicate, sodium aluminosilicate -are all anti-caking agents whose role is to prevent the salt from mixing with water, in the box or within the human body, thus preventing the salt from doing one of its important functions on the organism and denying you sufficient organic health to ward off illnesses. Comparing Natural Celtic Sea Salt to Mexican Salt? Much of Mexico's crude salt, after being bulldozed, is shipped in bulk mainly to Japan. There it is refined by electrolysis and used in miso, soy sauce, and other so-called "natural" products, then shipped back to natural food stores here. A state law forbids any Japanese firm or individual from making their own salt. The refining and sale of salt is a government monopoly, monitored by Japan's Salt and Tobacco Bureau. Their entire supply is imported and always highly refined. A healthy trend has sprung from that: it consists in artificially "loading" the refined salt with specific minerals in order to reconstitute it. While this does not MAKE natural salt, it is a step in the right direction. There is at least one miso maker in the U.S. who uses Celtic salt for his fermentation. His product is rated above any of the Japanese imported miso. A smaller amount of this Mexican crude salt is bought by Californians, who boil and recrystallize it into a totally demineralized white salt which is often sold through natural and macrobiotic food channels under the name "Balanced Minerals Salt." However, the boiling of crude salt removes all its precious trace elements. This deficiency has been recognized as the primary cause of demineralization and malabsorption. The following two analyses, performed at a Boston-based laboratory, are further proof of the value of natural Celtic Sea Salts. By and large, the essential minerals in Celtic salt are 10 times that of the "Balanced Minerals Salt" of boiled Mexican salt. Table 1 uses the Emission Spectrographic Analysis of oven drying, while Table 2 uses the Atomic Absorption Method. Such analyses seldom agree totally, even when performed by the same laboratory, however, both tables show that Celtic gray sea salt contains 10 times more trace minerals than the Mexican refined and boiled variety. The moisture assay at the end of Table 1 is also worth noting, since a dried salt does not retain volatile trace elements, but moist salt does.